These days it seems every big name cereal or biscuit maker has to have a presence in the Breakfast biscuit market. We've got Kellogg's, Weetabix, McVities, the supermarket own brands and of course, the original Belvita Breakfast biscuit which seemed to start the trend. 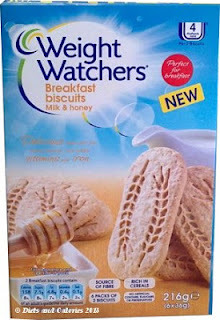 And here's the latest to make its entry – Weight Watchers Breakfast Biscuits Milk & Honey. It's easy to spot the Weight Watchers Breakfast Biscuits sky blue packs among the myriad of competitors. Each 216g box contains 6 packs of 2 biscuits whereby each pack is worth 158 calories and 4 ProPoints. Milk & Honey was the only variety displayed on the shelf and there isn't any mention of others on the pack, so Weight Watchers may be testing the water with this first variety. Honey is a popular flavour as most of the other breakfast biscuit varieties also have this choice. Like the others, these biscuits have their own wheat motif engraved on the front. They're also enriched with B vitamins and minerals including iron and calcium. They're a reasonable source of fibre with wheat and oat flakes in the ingredients and they're free from artificial colours, flavours and preservatives. So what are they like? Having tried out most of the breakfast biscuits on the market, I wasn't expecting anything out of the ordinary. To look at, they're a nice pale colour which should rule out any burnt taste. And around half of them were already broken, so it looks like they're quite fragile! They're a bit bigger than other breakfast biscuits which unfortunately means they have more calories – 79 each. This is quite high for just one biscuit. But, if eaten as suggested – two biscuits with a piece of fruit and a Weight Watchers yogurt, you'd have a breakfast for around 250 calories. Unwrapping the packs there is a pleasantly sweet and oaty smell with a faint hint of honey. They're quite hard to bite into and have a very dry texture. 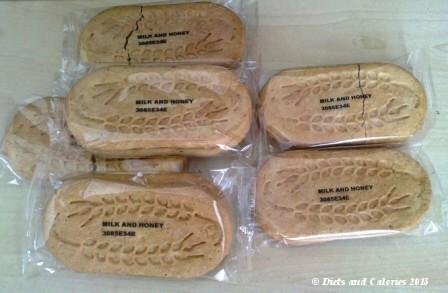 To be honest, they remind me of babies rusks! They flavour is nice but I prefer a chewier biscuit. These were purchased in a branch of Waitrose. Nutrition information per 2 biscuits: 158 calories, 2.7g protein, 24.8g carbs, 7.1g sugars, 4.8g fat, 0.4g saturates, 2.6g fibre, 0.1g salt. 4 ProPoints. Suitable for Vegetarians. Glad I wasn't the only person not to be impressed with these. Mine were all broken too, so annoying! 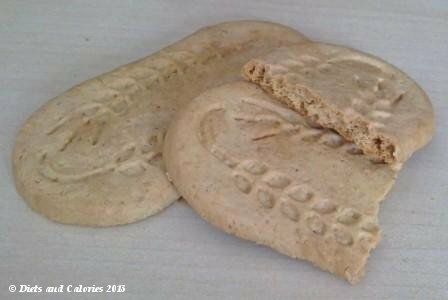 And now you mentioned it, the taste does resemble Rusks! Strange!